I'm not using DCC, but I will have a DPDT switch for the Y section. I might well bung in an LED or two on the control panel to indicate whether or not the switch setting is correct for the points' settings - saves getting a loco stopping on entry or exit because the polarities don't match. 1) Tamed the rat's nest of wiring to feed to an array of D-sub plugs/sockets and cables to a control box with a mimic panel on top. I've doubled up the plugs sockets so that the control panel can be fitted to either the front or back of the layout. All the point motor wires go to studs on the control panel and all appear to be working properly now - several have needed some adjustments but seem OK now. 2) I've replaced one point because I decided I didn't like my original choice. At the far end of platform 3 the point for the running round loop is supposed to be curved so I used a Peco double radius point. Unfortunately, the smaller radius was really too small so, although the curve around the loop was just right I ended up with an unpleasant s-bend at the start of the platform road and where the platform end will be. So I decided to take the hit and have a short straight in what should be a curve all the way around the loop in order to have a more attractive curve into and through the platform road. 3) I've also installed Gaugemaster uncoupling solenoids in as many locations as I anticipate and using as many spare pins I had available on the plugs/sockets - apart from four which Amazon claim to be delivering on Wednesday. I've put one each at the North end of all three platforms, one each at the North end of the four longest fiddle yard roads (leaving the fifth purely as a running round loop), one each in the shorter goods yard sidings and two each in the longer ones. That should suffice for my needs, if I need to do more I'll resort to the giant toothpick from the sky because I've run out of spare pins in the connectors now - unless I try doubling up and working two solenoids off one switch. I wasn't impressed with the pushbuttons that came with the solenoids. They didn't seem to have much tolerance to the heat of the soldering iron before the plastic bodies softened enough to dislodge the contacts, so I've gone for SPST sprung toggle switches instead. now fixed down and wired. The TT is powered by a small motor and metal geared worm gearbox from the Bay of E. It is supposedly a max speed of 10rpm but will move much slower than that. I've wired it in so it can be powered from either of the two controllers and it will turn slowly enough that lining up the track by eye is not too difficult. Power is fed to the track by means of a slip ring on the driveshaft. I've done the polarity reversing by means of a rotor under the pit with a small magnet on the end and four reed switches. when the switches close they trip a latching relay wired up as a DPDT crossover switch, which works a treat. 5) Having found that an unexpected gradient on the layout was neither the baseboards nor the table on which I stand them but the flipping bedroom floor, I've sorted adjustable legs on which to stand the table. I wanted more strength and adjustment capacity than most that I could find at an acceptable price, so I've adapted some small scaffolding tower adjustable feet, which a) give me the baseboard height I want and b) give me more adjustment than I'm ever likely to need. Newportnobby will, I'm sure, be relieved to hear that I've had no nasty "off" moments at the board edges, despite exhaustive playing testing, although as I said before I will ultimately be having scenery or catch fences "just in case". I've actually been very pleasantly surprised at how good the roadholding of n-gauge stock seems to be. The bigger annoyance is the Peco couplings which don't seem to tolerate much of a bump - even the bump of a short wheelbase wagon on a crossing nose seems to be enough to make them uncouple sometimes. I think it's the wagons bouncing that's doing it so I'll try adding a little weight to hold the wagons down more. As per my reply to Shropshire Lad, I have put a DPDT switch in for the reversing wye, which is working a treat. I've done a prototype circuit to give me a polarity mismatch warning indicator which I'll include when I do all the point direction indicators. The latter will all use a latching relay to switch on one of two LEDs in the mimic panel and the reversing wye will have a slightly modified circuit. I'm using a quad-pole double throw switch for the wye, two poles of which are the track power crossover switch and the other two poles will combine with the latching relay for the point indicators to turn a bi-colour LED from red to green if, and only if, the polarity switch is set the correct way for the point direction. All the relay circuits are a "fill in job" at present as I've got quite a lot of them to do so I'm doing a few at a time. My main current job is making transport casings for the three boards so that they can be protected from damage (especially the track where it crosses the board joins) before even being removed from the table and so that they can be stored safely or stacked in the car when I take the layout down to the club. This is a fairly high priority because as the weather improves and the days get longer I'm likely to have friends/relatives wanting to use the spare room, which means the layout will have to be temporarily evicted from time to time. The next job will, on current plans, be to start on the basic scenery structure, which will be carved lumps of Kingspan/Celotex type insulation board let into and/or glued to the baseboards. I took a trip up to Coniston with the camera a couple of weeks ago to see how much of the terrain remains and how much I would have to guess. I was very pleasantly surprised to find that all the terrain is largely unchanged, the developers just used the large flat area on which to build and left the rest, as far as I could see, "as was". The only change I could see was debris netting on the cliff face above where the coal siding was. There's even one original building, the slate office, still there so I'll be going back sometime to wave my tape measure over that and take more photos of it. Most of the slate wharf is still there too, half of it now being a car park. After doing the basic terrain I still won't be doing the ballasting - got to do the point rodding first, and probably the platforms too, so that I don't have to dig up ballast to fit those. The platforms will have to be removable, I think, because they cross a baseboard join. It'll look better if I have them (and the main station building) located on pegs and with no joins to try and hide - if anything, they'll help to hide the baseboard join with a bit of luck. Sounds like excellent progress. This will be a lovely layout. Many thanks for the interesting update. Very much looking forward to seeing the fruits of your labours. As for the Elsie couplings, I find a dab of 'Tacky Wax' generally prevents random uncoupling. Thanks, John. I certainly hope it will be but I'm under no illusions other than there's a long way to go - and a lot more to learn. It's been quite a learning curve so far - having never worked in N-gauge before, never tried to make a portable (well, luggable) layout, never used point motors, never used a control panel, etc., etc. Still to come is the never-done-before point rodding, never-done-before ballasting, never-done-before carved polystyrene terrain, etc., etc. All good fun though. Thanks, as soon as I have some visual changes worth photographing I will do so. Thanks for that, I'd never heard of it before but will get hold of some sometime. The worst are the Peco Elsies, but my oldest Farish carriages could use it as well. Their couplings are part of the bogie moulding, just sitting on the end of a swan-neck plastic "spring" arrangement, and they are also prone to uncoupling themselves randomly. All the new Farish stock with sprung couplings seem fine, as do the Dapol wagons I have. Another update, with a couple of piccies before I take it all apart since the next few jobs need the three baseboards to be separated and it may be a month or two before it all goes back together again. Apologies for the awful lighting. There's only a window at one end of the room and nothing at the other, and it's not helped by much of the scenery in its current state being white but it gives an idea of what it'll look like. When it's more worth getting decent pics I'll sort out better lighting. Since the last update, I've started on the scenery behind the station, made the foundations for the cattle dock and slate wharf and made the edges of the station platforms. The scenery behind the goods yard is rough hewn polystyrene and will become rough hewn slate with a liberal amount of vegetation growing on it - so there's little more to do than a bit of trimming, paint it and plant loads of suitable "foliage". Behind the southern end needs a little more work because that will be a vegetated slope with a slate retaining wall above whilst the northern end, behind the slate wharf and approach road, needs a lot more work. That needs to be more of a hilly area with two roads cut through it and a load of trees on top. 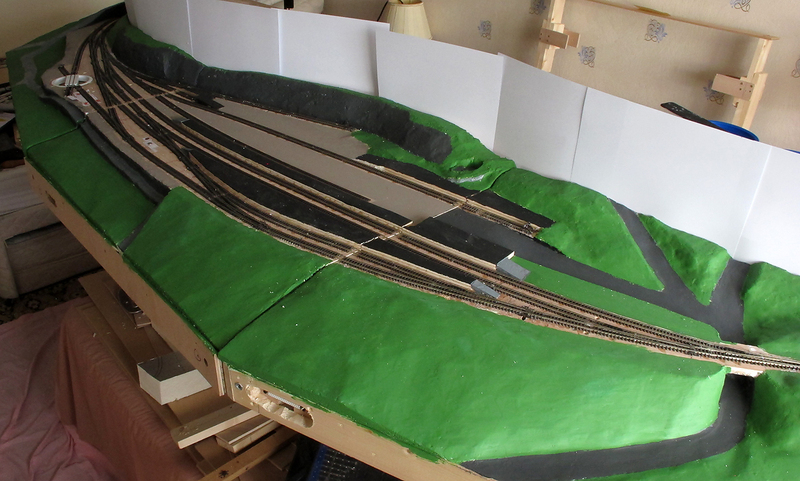 Before I can do that area, I need to take the baseboards apart so that I can inset a block of polystyrene in the hole, carve it to represent the area that is below track level and blend it into the landscape above track level. Conveniently, all the rough hewn slate above the goods yard and the area to the south are topped with a slate wall separating the drop from a small road serving the houses above the station. This will form an ideal way to conceal the join between scenery and backdrop - I'll include the wall in the scenery and fit the backdrop just behind that. At the northern end it's all (or mostly) tree-covered so the trees will hide the join there too. No, the backdrop won't be sheets of white card just propped against the scenery, as shown in the piccies, I put those in to give me a feel for how high it needs to be. I'm hoping to find a suitable vantage point on the other side of the valley to take a photograph of the site which, when edited and scaled, I can use for the backdrop. Hopefully I'll be able to get it printed onto a roll of canvas in one length so I can avoid visible joins and also just roll it up for transport. The platform edges as fitted are slightly low and slightly too far from the track, leaving me room to add the facings and top surfaces later. I decided to fix the platforms down rather than make them removable so I can be sure of trains fitting through them. That will give me one baseboard join to hide but the station building and train shed will deal with platforms 1 & 2 and I'm sure I can contrive a group of people and/or a pile of luggage to do likewise on the bit of platform 3 on which the join will show. The station building and train shed will still be removable, though. I'm not going to try and make that in two sections and hide the join - besides which it may be too tall to fit inside the transport casings, the heights of which are dictated by the available height inside my car. I haven't done much with the scenery at the eastern side (the front of the layout when viewing it) yet, just cut some polystyrene blocks to fit the spaces I'd left. They will need quite a bit of "mining" to create the correct terrain profiles so I've ordered a hot wire cutter to make that job easier. A carving knife worked well (albeit, messily) for the convex shapes at the back but isn't so good for concave ones as will be needed at the front. There needs to be a road down from the overbridge at the southern end, a section below a slate retaining wall from there to about halfway along for a footpath and the locations for houses, then a wooded slope before the road leading up to and through the underbridge at the north end. This is from the north-east showing the station approach and goods yard. This is from the south-eastern end showing the whole thing. 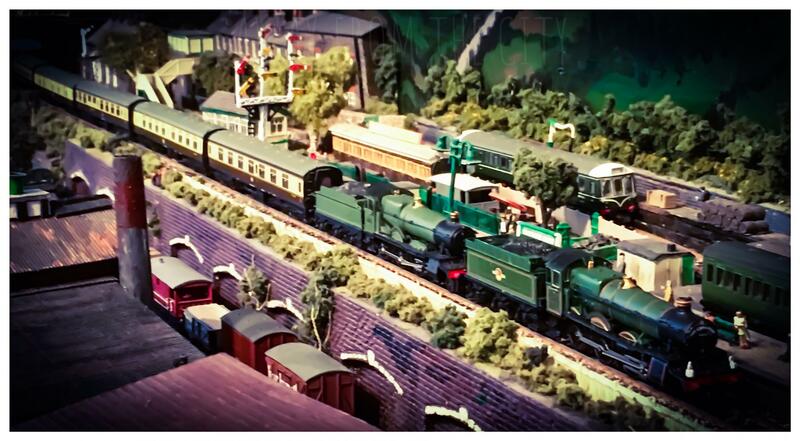 It's obviously a busy time at the station - we have a Jubilee coming in with an excursion from Blackpool whilst a Fairburn tank is waiting to take the branch passenger service off to Foxfield and a 4F is waiting in the yard to depart with a goods train. The Jubilee must be required for other duties since there's a Black 5 waiting, in the road behind where the signal box will be, to take the excursion back later. The 3F Jinty on the turntable is propelling a fresh wagon of coal to where the coaling stage at the end of the loco shed will be, whilst the "not a Jinty" 0-6-0 is parked where inside the loco shed will be. Thanks for the update. I can see this being a cracker of a layout, especially as I'm a sucker for curved platforms. Many thanks for the update. I really enjoy reading about Coniston. This is coming along very nicely and I look forward to the next instalment. I like the touch with the Camberwick Green wagons in the background. especially as I'm a sucker for curved platforms. I'm not so averse to them now I've found that it's easier to bend and fix thin strips to the correct shape than to cut the edges of a wide piece, especially for an island platform and concave curves. However, I decided to do Coniston because a) it's fairly local to me, b) it's an interesting station layout and c) I found a detailed track plan in a book about the Coniston Railway. Once the location was decided, the operator and timeframe was decided by a) there's little, if any, ready to run Furness Railway stock available and b) I don't like the almost flat replacement loco shed roof that was fitted after they had a fire during WWII. That eliminated FR and BR, only leaving LMS. Hehe, I saw those on the forums and couldn't resist asking Robbie if he could make a set for me too. Once loaded they can be the coal yard wagons and free up my LMS open wagons for the slate traffic, with a couple kept back for the loco yard coal and ash wagons. Well, I've been busy since the last update (again) and since it's a nice bright afternoon with plenty of light permeating right to the back of the room, I thought I'd rattle off a piccie since the layout's changed rather a lot since last time. Over the last fortnight, I've mostly been "mining" and created the basic scenery to the east side of the station, the viewing side of the layout. Having done that, I decided to paint it since I always find it easier to spot blemishes when the colour is uniform, rather than a mix of the base material and filler, so I decided to paint it in approximately the finished colour scheme so that I, and others, can begin to get a feel for what the finished thing will look like. After quite a bit of filling/sanding/filling/sanding again, I'm pretty happy now with the hills for the foreground. They don't look even but this is in the middle of the Lake District fells, you just don't get nice smooth surfaces except in well-tended gardens, so I've concentrated on making sure there are no obviously unnatural blemishes (holes, straight edges, etc.) except where they'll be covered by foliage anyway. The whole lot will be getting a dose of flock or static grass so that'll smooth minor blemishes out a bit as well. The eagle-eyed observers will have noticed that I haven't matched up the baseboard joins yet - that's the next job on the list. The mismatches are accentuated anyway because the baseboards aren't actually joined together at present, just pushed up against each other, which also explains the "steps" in the platforms and, worse, the rails. That is, also, why there aren't any trains in sight. The boards are separated at present because, apart from doing the scenery below the track level, which needed access from underneath, I've also been working on the transport casings, having measured to ascertain what overall height I can fit in the car, because that dictated how high I could make the background scenery - the odd-looking timber framework in the background is the gauge I made to see precisely how much height I had to play with. While the boards are apart I'm also finishing off the tracks at the baseboard joins, securing the rail ends at last. 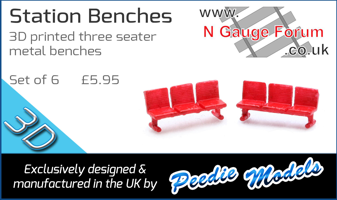 The transport casings are designed to protect the rails anyway, by having a 3mm layer of plywood on the inside face below track level so there is that gap between the rail ends and the rest of the casings and the boards won't be moved around without the casings in place. The idea is that the #bards are lifted onto the table before the casings between two boards are removed, then the boards are simply slid against each other, so there is little scope for bashing the rails ends. Likewise, when taking it apart, the boards are detached and slid apart, then the casings go on before the boards are lifted at all. In view of that, I'm not bothering with either screws to which the rails are soldered nor with copper clad "sleepers", neither of which I find look particularly good. I'm simply fitting additional sleepers to fill the spaces where I had temporary rail joiners and liberally flooding the ends with the gap-filling superglue I used to hold the track down, thus the sleepers are glued to the baseboard and the rails to the sleepers. The "surplus" glue will be covered with ballast anyway. I had thought of using epoxy resin but this superglue is fantastic stuff - the only way to separate things stuck together with it is to destroy at least one side of the join. The roads/paths are as yet just painted on to show the positioning of them, when I do them properly I expect I'll do them using fine grade emery paper to give both colour and texture - I'm pretty sure that by the late 1930s they would have been tarmacced so I ought to be safe enough doing that. However, I'm unsure what to do about the station approach and goods yard. All the photos I've found are not clear enough to determine whether it should be tarmac or gravel - considering the location it might well have been crushed slate in the yard, in which case I'll probably use sandpaper but give it an appropriate grey colour wash. The platforms are just painted black for now, but they will ultimately have stone slab edges and slabs over the entire width under the train shed, with gravel infill along the rest of the platforms - I'll represent the gravel with sandpaper and the slabs with, I hope, suitable coloured card which should give a little texture and avoid the need to paint both the surfaces and edges of a large number of tiny slabs in an alternative material. The hole in the hill at the back, just to the left of the nearer baseboard join is intentional, it's the foundations for the slate office. The odd-looking "shelf" running from in front of the turntable to halfway along the front is a footpath running below the station site retaining wall, with a further walled drop below it. That aspect of it will be tidied up when I've photographed some suitable walls and turned them into something printable. The hill in the immediate foreground, sloping down to the access road, will be wooded. The trees and associated undergrowth should hide the baseboard join well, although I'll make it pretty darned close a join anyway, only relying on the foliage to hide the actual straight edge. Likewise, the hill at the back between the slate cliffs to the left and the roads to the right. The left hand road is the one that runs up to and across the top of the cliffs, whilst the right hand one continues up the fells - in both cases the join between road and backdrop should be concealed by trees, etc. The first half of the ground below the path, as well as the area between the track and the road beyond the turntable should contain houses but for the initial build I'll do those areas as grazing land enclosed with walls, suitably populated with Herdwicks, the local sheep breed. My work will be cut out quite sufficiently making the railway buildings, especially the station building, goods shed and train shed for which I have no drawings, so I'll leave non-railway buildings for much (much) later. Once the baseboard scenery and track joins are completed, I can start on the first really fiddly job - the point rodding, because I need to do that before the ballasting. I intend to make the rodding from 0.2mm spring steel wire on carriers made from plastikard. Not sure yet what I'll use for the cranks, possibly some slightly thicker wire. That'll keep me out of trouble for some time, especially as the garden is growing now and will need quite a bit of my time too. Thank you very much for this informative and detailed post.